1. Safety is the top priority of Abel Mountain. All campers must follow the rules and regulations as well as use common sense. Any situation not directly covered by the rules but deemed unsafe by a staff member will be addressed. Decisions of any staff member are final pertaining to noise, campfires and other infringements of the campground rules or unsafe acts/conditions. Disrespect of authority, property or other campers is grounds for camper removal. Abel Mountain Campground reserves the right to amend rules at any time. 2. The speed limit in the campground is 10 MPH for all vehicles. This is a must as children, bicyclists and other pedestrians share the roadway with vehicular traffic. Safety bumps have been installed to slow vehicles. Please do not avoid them by driving on the lawns. 3. Normal office hours are posted at the office. If the office is unattended during normal hours, please use the call box to the left of the door to notify us of your presence. Instructions for call box use are on the call box. 4. No smoking in any of the park buildings, the pavilion, the pool or the playgrounds. Please dispose of your cigarette butts in receptacles located around the park. Help keep our park clean by using the receptacles instead of dropping the butts on the ground. 5. Please help us keep the restrooms and bathhouses clean and ready to use by others by picking up after yourself. Dishes and clothing should not be washed in showers or bathroom sinks. Please, no dying hair or clothing in the showers or sinks. Children under 6 must be accompanied by an adult while using the restrooms. If a problem is found in any of the restrooms, please report it to the office immediately for corrective action. 6. All registered campers and day guests must check in at the office upon arrival. Day guests will be charged $5 per adult (18 and above) and $3 per child (17 and under) if using facilities or attending scheduled activities (Pig Roast guests $10). Day guest hours are 9:00 AM to 10:00 PM. Any day guests remaining after 10:00 PM will be considered an overnight guest and subject to additional fees. Overnight guest hours are from arrival until noon the following day. Overnight guest rates are $7 per adult and $5 per child. Registered campers are responsible for the actions and conduct of their overnight or day guests and must be on-site while their guests are here. Guests of long term campers with seasonal visitor’s passes are required to check in at the office for a car pass, even if no fees are required. Abel Mountain reserves the right to limit the number of day guests per site. WiFi access is not included in day guest pass fees, WiFi access codes are sold separately. 7. Check in time is 1:00 PM or later, check out time 11:00 AM at the latest. Please notify the office if your arrival time is outside normal business hours. Please check with the office if you wish to remain on your site after normal check out time. Early arrivals and late departures will be charged $20. 8. Each campsite is allowed a maximum of six people overnight. One additional tent is allowed per site at $10 per night plus overnight guest fees, where applicable. 9. Each campsite is allowed a maximum of two vehicles. Extra vehicles may park on the storage lot on the hill. Parking should be within your campsite’s boundaries (utility pedestal to utility pedestal) and off the roadway. Transient campers bringing utility trailers should check with the office prior to arrival. 10. Washing vehicles and campers at the campground is prohibited. 11. Quiet pets on leashes are welcome. Pets may not be left unattended at the campsite. Picking up your dog’s waste immediately is mandatory. There are four pet waste stations located throughout the park (see map for locations). Pets are not permitted in the pool area, playgrounds or in any of the bath houses. Noisy pets, failure to keep your pet on a leash or failure to pick up after your pet could result in a request to remove your pet from the premises. Aggressive pets will not be tolerated and will be required to leave the premises. All pet owners should have, in their possession, current copy of their pet’s rabies certificate. 12. Campsite boundaries are utility pedestal to utility pedestal. Please respect other campers’ sites and refrain from crossing others’ campsites unless permission has been granted. Please stay on roads and designated paths throughout the grounds. 13. Please keep your campsite clean during your stay and leave the campsite in same condition you found it in when you arrived. 14. Please be responsible when having a campfire and keep campfire contained to a fire ring only. Campfires should be extinguished before retiring for the night and should never be left unattended. Fire rings are not to be used for garbage cans – only newspaper, kindling and firewood should be burned in the fire ring. Please do not move the fire rings, we do not want multiple burnt spots on the sites. 15. Per Vermont law firewood must be purchased in-state unless it is heat treated and a certificate verifying such is provided. To protect our trees and surrounding woods please do not transport untreated firewood from out of state. 16. There are three trash dumpsters, three recycling dumpsters, and three compost stations in the park for waste and recycling generated at the park. See the park map for locations. Recycling is required in Vermont, please check with the office if you are unsure what is recyclable. Do not dispose of large items (including, but not limited to TVs, air conditioners, refrigerators, electronics, furniture, rugs, mattresses, etc.) in the dumpsters. These items should be taken home or disposed of at the Randolph Transfer Station at the camper’s expense. Compost stations are for vegetable and fruit food waste only, no meat or dairy products please. 17. Please read, and abide by, the pool rules posted at the pool on the gates and on the white banners inside the pool. Children under 16 must be supervised by an adult while using the pool. There is no lifeguard on duty, please be watchful of your children at all times. Pool hours are 10:00 AM - 8:00 PM, but the pool may be open later in the evening on hot days. Please no diving or jumping into the pool – serious injury could result. Anyone jumping or diving into the pool will be asked to leave the pool area. Children under three and all others not toilet trained are required to wear swim diapers or snug fitting plastic pants. The pool will be closed when the temperatures are not expected to exceed 65 degrees Fahrenheit during the regular season. The pool will be closed at the first instance of thunder and will remain closed for 30 minutes after the last instance of thunder is heard. Please exit the pool as soon as you hear thunder! 18. Children under 10 should be supervised by an adult when playing at the playgrounds. 19. Rough housing or poor behavior in the pool or at the playgrounds will not be tolerated. Parents will be asked to remove the child to their campsite until the child has calmed down. 20. Bike helmets are strongly recommended for children. Because they are difficult to be seen, low profile pedal bikes or pedal cars will be required to have a safety flag not shorter than 5' tall attached to it, or have an adult walking along side as the child rides them. Children’s gas or electric cars/carts are not allowed in the park. Lights and reflectors are required when riding bikes after dark. 21. ATVs or other motorized off-road vehicles are not allowed to be driven in the park or on the hiking trails. Seasonal and long-term campers that bring golf carts must abide by the Golf Cart Regulations provided with their camping contracts. 22. Hiking trails are for day hikes only (no overnight camping). No one under 18 is permitted on the trails without a parent or guardian. See hiking trail map for further rules. 23. Quiet time in the campground is 10:00 PM to 7:00 AM. During this time voices, activity and other noises must be kept to a minimum. Please be aware that normal speaking voices can carry. Outside radios and TVs should be turned off. However, Abel Mountain reserves the right to briefly extend quiet time as it may pertain to entertainment provided by the campground for all its guests. 24. This is a family friendly park. Campers’ activities shall not interfere with other Campers’ use and quiet enjoyment of their site. Disturbing others, disorderly conduct, fighting or obscene language may result in eviction. 25. 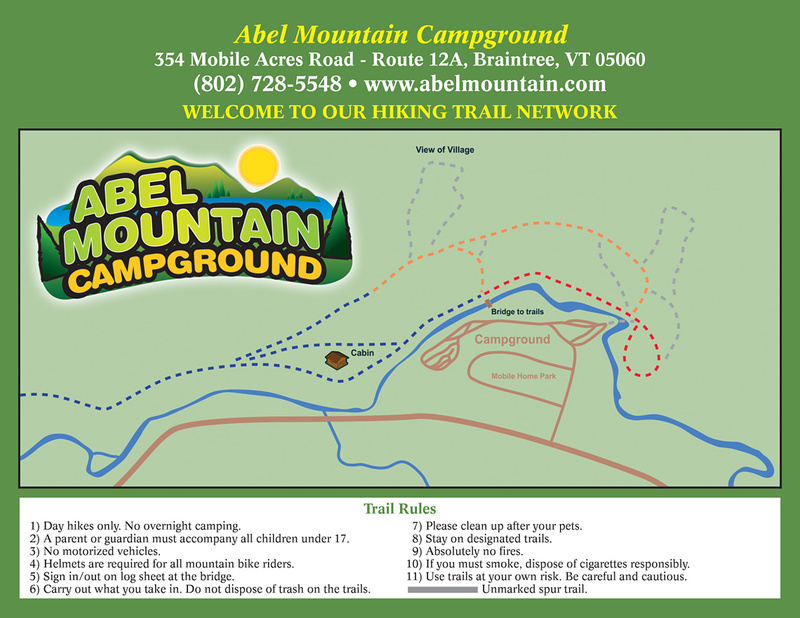 At Abel Mountain we strive to make the best camping experience possible for all. We have chosen to designate our park a drug free area. The use of any recreational drugs, legal or otherwise, will result in an early departure for the offenders. Thank you in advance for complying with this designation.